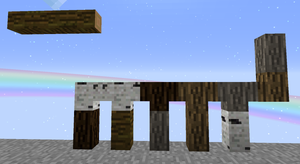 Birch Wood Post is a block added by the Garden Stuff mod. Like many other mod's decorations, Wood Posts have different look when placed on a ground, on a wall, on same object or on other object. Note: Any vanilla axe can be used. This page was last modified on 13 September 2016, at 20:41.